Exciting news for fans of Cassandra Clare’s The Shadowhunter Chronicles and classic fairy tales! Cassie and Cassandra Jean are teaming up to turn our beloved The Shadowhunter Chronicles characters into characters from fairy tales. 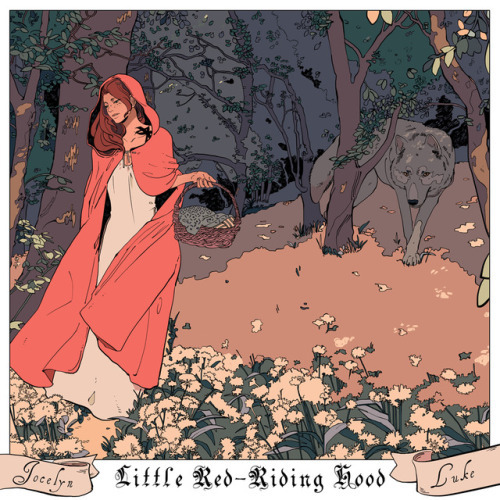 I’m excited to share a new project I’m working on with Cassandra Jean, in which we pair Shadowhunters with classic fairy tales! You may have seen a detail of this illustration as my twitter icon. Here’s the whole beautiful thing! It’s not just going to be an online project, it will be in print as well. Details to come! We love this ♥ Jocelyn looks so pretty and magical. This sounds like so much fun – we hope that Emma and Julian are going to be the characters from Sleeping Beauty because it would be so fitting. Furthermore, it looks like we are getting even more books set in the Shadow World! I also got a bunch of work done on Queen of Air and Darkness, and another secret project that I can’t talk about quite yet. By the Angel, could this mean more short stories co-written with Sarah Rees Brennan, Maureen Johnson and Robin Wasserman? What are you looking forward to the most? What are your guesses for the fairy tales chararacters? Sound off in the comments below! PS. Make sure you’re subscribed to Cassie’s newsletter. Visit cassandraclare.com and scroll down to sign up for it. Darn you Cassandra Clare, you took my idea! Jk, jk xD I’m sure hers will be way better than anything my caffeine-fried brain can concoct (especially since I just scribble down curious tales in my free time). I can’t wait to read the short stories! They’ll be a treat. Also, ‘secret project’? Color me most curious *sips coffee with a mischievous smile* I’ll be waiting for updates on this. Wow I can’t wait to read it. I’ve tried to do something like that a few times but my sisters jack with my computer the like that there goes what little I had of Clary as Cinderella and Jace Prince Charming. Rapunzel could be Simon and Isabelle. I think that would be perfect for them, especially with Isabelle’s beauty.